I have been very, very behind on my blog lately. A common complaint in the blogosphere, usually followed by a vow to do better, which never materializes. My impression is that making unrealistic blog resolutions is the beginning of the end of a blog. So I'm not going to make any promises, only try to keep plugging away at the many gardens still in my un-blogged stash. I am now finally getting around to the Germany trip of last fall, one of my best garden visiting trips so far. 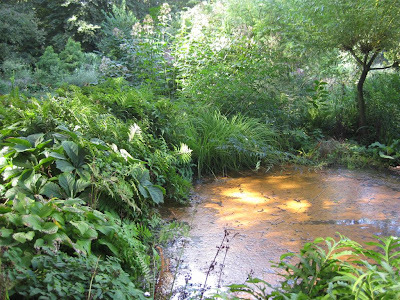 The first garden we went to was Peter Janke's in Hilden (near Dusseldorf), which I learned about through James Golden's Federal Twist blog. Janke is a nurseryman, garden designer, and one of the leading figures in the exciting German landscape design scene. 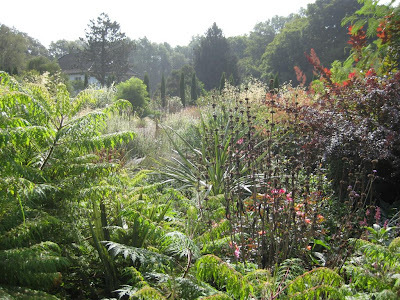 His garden is a very large, rectangular piece of land, bordered by a very busy road on one side and an impressive mature forest on all others. 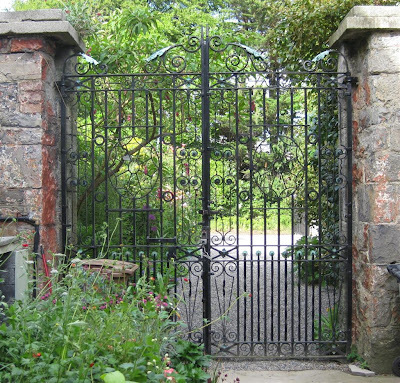 The driveway bisects the property from the road, and leads to the central house and nursery. 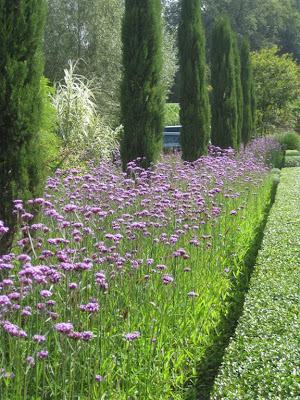 The driveway is the first impressive feature of the garden, with a very simple but striking use of Verbena bonarensis as edging along both sides (about 20m long stretch I would guess). 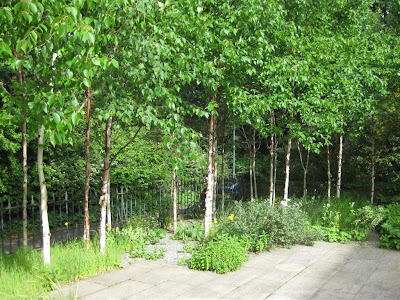 The right half of the front garden is occupied by a simple meadow with a circular pattern of mown grass in the middle, as well as a mown path bordered by fruit trees. At the time of our visit, the grass was uniformly tan in colour, with few other interlaced plants. 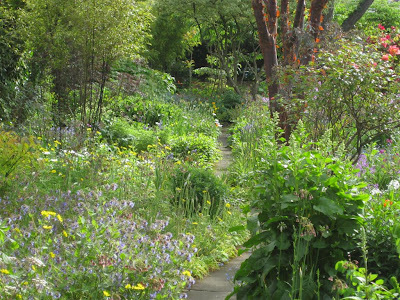 The left half of the front garden is taken up by the gravel garden, inspired by Beth Chatto's work in Essex. Peter Janke has studied with Chatto and credits her as a great influence on his work. This garden was absolutely spectacular at the time of our visit on September 4th. Everything seemed to sparkle in the autumn sun: delicate grass blades and seed heads, silver foliage, papery fall blooms and spiky dried flower heads. At the back of the property lies the woodland garden, where the presence of the mature forest is keenly felt. 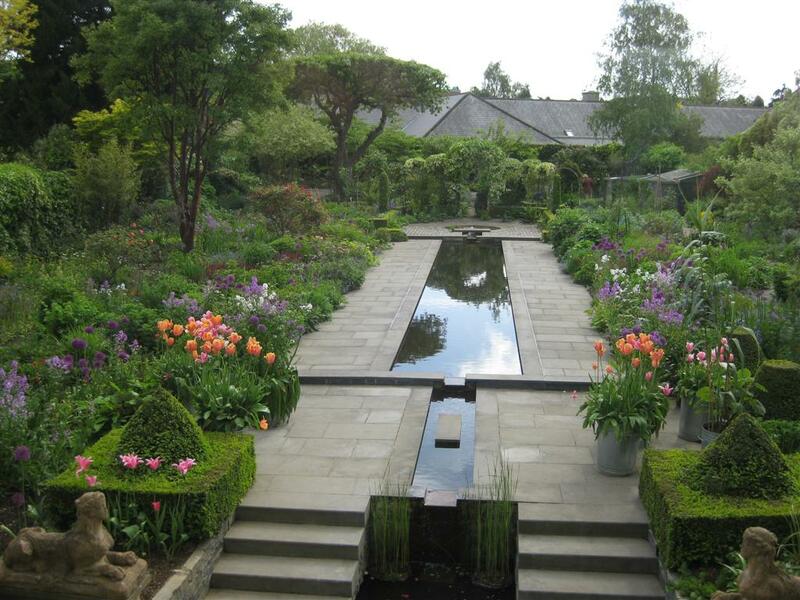 This garden is cool and wet, in contrast to the open front areas. Simple mulch paths snake through it, along the edge of the forest. The garden is so lush you can hardly see outside of it. 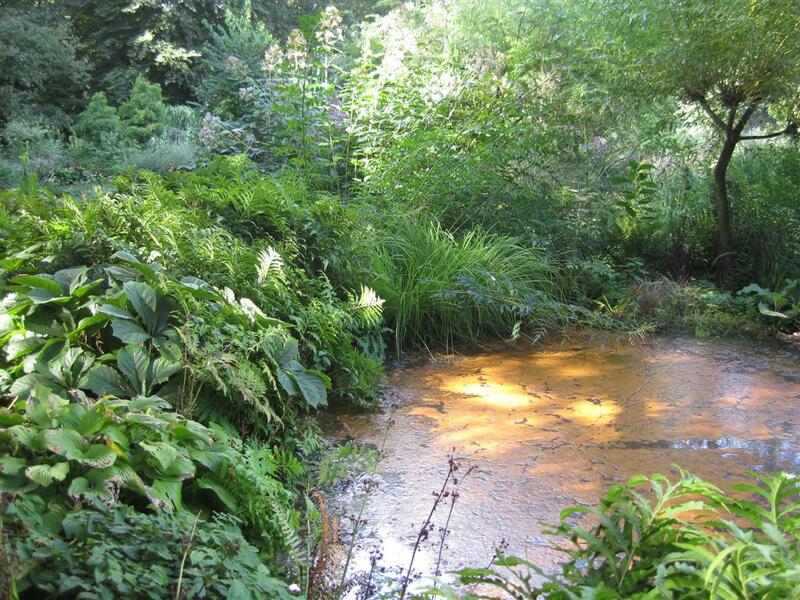 Many small and larger ponds are hidden between the foliage, and some were covered in a copper or rust coloured film. I'm not sure what the source of this is, but it made for an interesting contrast with the surrounding green. 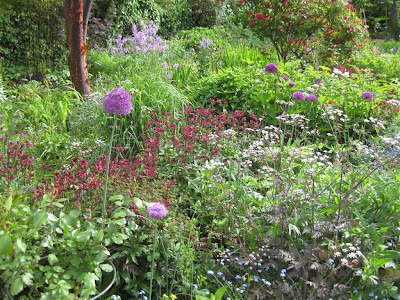 Everywhere in the garden, there were little details that caught my eye, such as the interesting border edge below. 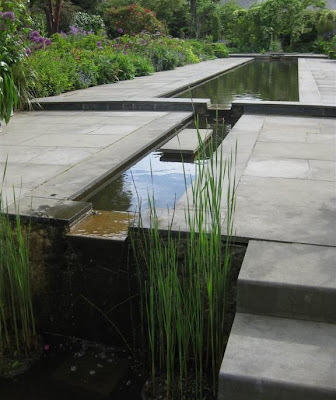 Or the wild abundant herb garden, with plants popping up through every crack in the paving, creating that beautiful contrast between geometrical and organic lines. And the imaginatively pruned or placed trees throughout the property. 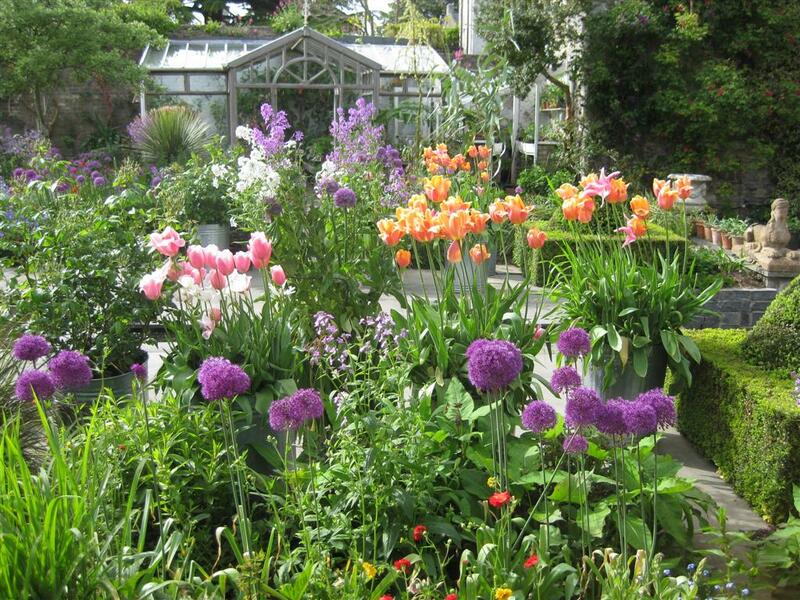 It was definitely a treat to be able to visit this garden. 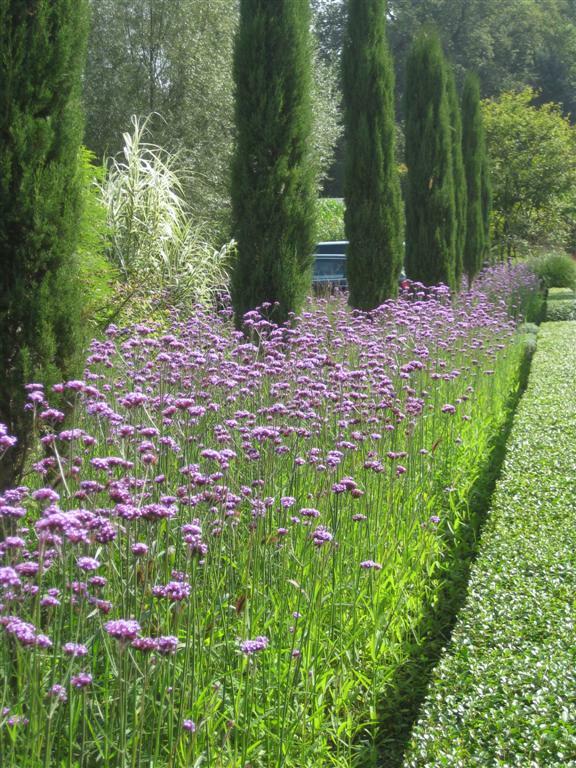 It combines a great mix of modern and classic, both in the design and the plants. It might have been even better if I spoke German as Peter Janke did a tour of the garden (we visited on a special open day). Would have loved to learn from what he had to say, although the garden was already a good teacher by itself. A few weeks ago, we were in Ireland for a wedding and family reunion. 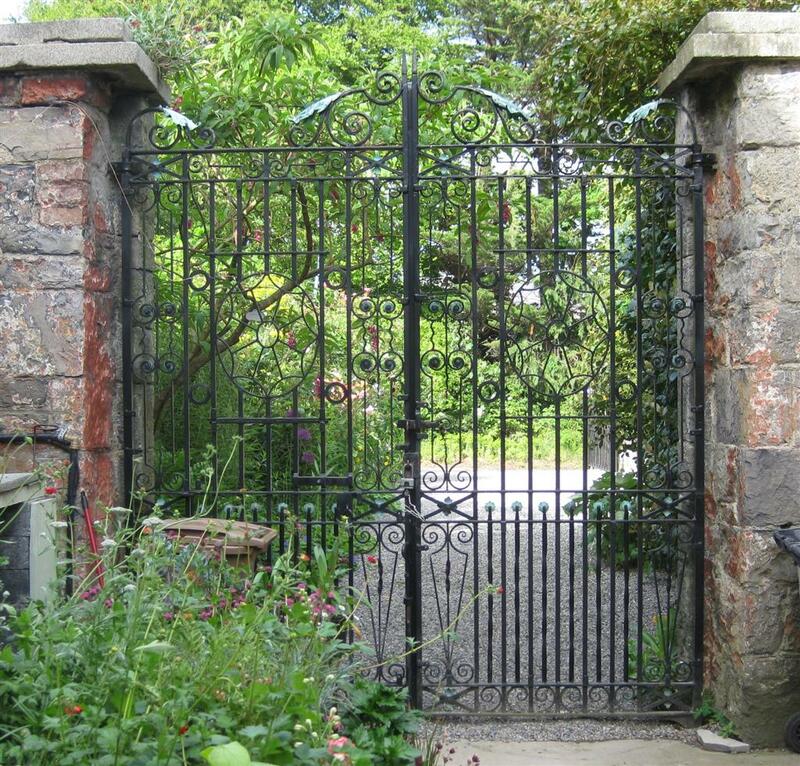 But high up on my scheming gardener's mind was, of course, visiting gardens. What self respecting gardener could possibly find herself in Dublin and not make a visit to Helen Dillon’s iconic garden? 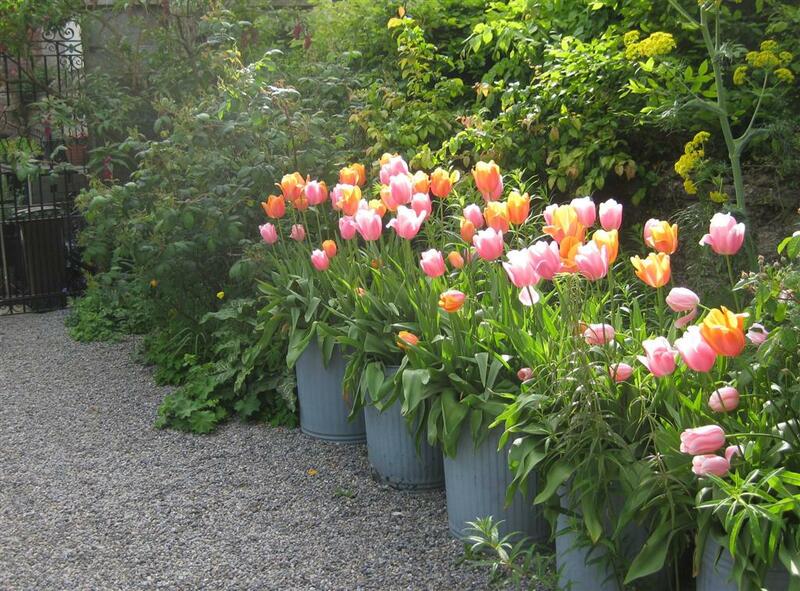 The Dillon garden is set in a Dublin suburb, on a little street just off a main road. The front yard provides the first hint that a gardener lives here: it contains no less than 51 birches concentrated around the perimeter of the garden. That may sound like a ridiculously high number of trees for such a small space, but it actually works. I’m not sure how they will grow over the long term, but it is an example of not being too afraid to plant trees close together – they are used to growing in a community and touching each other! Our obsession with leaving miles of space around trees allows them to grow into huge specimens, but it’s not the only option. The main garden, the one we’ve all seen in pictures, is in the back. I already knew what to expect, but it was still stunning to see it first-hand. The best view, we were informed, is from the living room window (picture below, snapped in a hurry). Not many people can say that they look out to that from their couch. I couldn’t help but imagine what it would be like if everyone actually decided to do something with their suburban backyard, something crazy and passionate like Dillon has. Wouldn’t our towns and neighborhoods be so much richer and more beautiful? Our visit was in the middle of May and the borders already felt complete. Unfortunately, it was too early to have the full effect of the hot and cool borders on either side of the pond. But we could still enjoy the careful planting of every nook and corner, the many studied plant combinations and of course the drama of the central pond. I even managed to meet and ask a few questions of the very energetic and friendly lady of the house. Best of all, at the end of our visit, Dillon’s husband Val, inquired if we’re from the “gardening world”! Um, er, no, but wouldn’t it be fun to be able to say yes to that question one day.